For 3-4 years old. This is a 55 minute class teaching dancers basic steps of ballet and tap,plus choreography. Each class will include a warm-up stretch, across the floor and center floor. For 4-5 years old. This is a 55 minute class teaching dancers basic steps of ballet and tap,plus choreography. Each class will include a warm-up stretch, across the floor and center floor. *Recommended previous combo 1. For 5-6 years old. This is a 55 minute class teaching dancers more advanced steps of ballet and tap,plus choreography. Each class will include a warm-up stretch, across the floor and center floor. *Recommended previous combo 1 & 2. For 4-6 years old. Dancers will stretch for the first 10 minutes of class, then dance to upbeat music, while learning the latest hip-hop steps. We also like to move across the floor and learn to "free-style" Then learn a quick dance combination to get used to counting. For 7-10 years old. Dancers will stretch for the first 15 minutes of class, then dance to upbeat music, while learning the latest hip-hop steps. We also like to move across the floor and learn to "free-style" and learn a combination at the end. For teens. Dance to upbeat music, while learning the latest hip-hop steps. Great cardio workout! For 7-14 years old. This class is for the beginner who has little or no previous dance experience. The instructor will go over basic feet and body positions at the barre, stretching properly and short combinations. For teens-adults. This is an intermediate level class. Pre-requisite-please call first. This class is for technique and strengthening in preperation for Pointe work. Pre-requisite-please call first. For 7-10 years old. This class is for the beginning dancer. We will learn proper stretch and technique as well as learn some fun choreography to upbeat music. Our curriculum safely increases skill level while developing balance, coordination and the ability to perform basic gymnastics skills. *Special rate for company members please call. Tots and Combos: Leotard (any color), skirt optional, pink tights, ballet slippers and tap shoes, hair pulled back off face. Ballet: Black leotard, pink tights, pink ballet slippers, hair pulled back in bun. No jewelry. 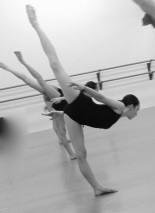 Jazz/Contemporary: Leotard, booty shorts, jazz shoes, hair pulled back in ponytail or bun. No jewelry. Tap: Leotard or snug top, shorts or jazz pants (no jeans), tap shoes, hair pulled back in ponytail or bun. No jewelry.